ONE (1) Sterling Silver Flat Cable Chain with Spring Ring Clasp - 2.3 mm Sterling Silver Flat Cable Chain. Choose 16, 18 or 20 inch. 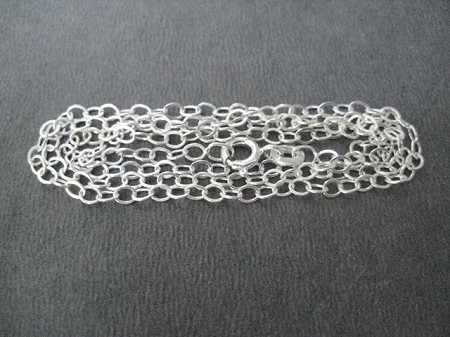 Your ONE (1) Sterling Silver Ball Chain with Spring Ring Clasp will arrive in a tiny organza bag for safe shipping. Choose to Add a Charm from The Run Home's Charm Collection by CLICKING HERE! If purchasing multiple CHARMS and ONE (1) STERLING SILVER FLAT CABLE CHAIN at the same time, please let me know in the NOTE TO SELLER on the checkout page if you could like me to add your CHARM(S) to your STERLING SILVER CHAIN. If no note is left at checkout, your ONE (1) STERLING SILVER CHAIN will arrive in a tiny organza bag.